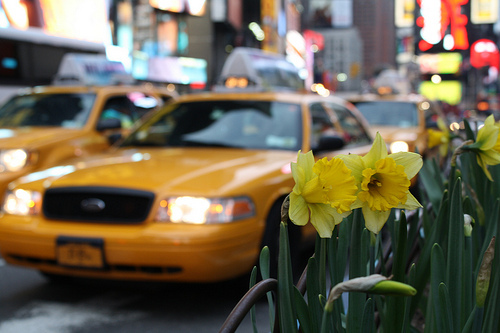 A Ford Crown Victoria taxi idles while waiting for passengers near a display of flowers April 10 in New York's Times Square. Mayor Michael Bloomberg paired with two members of New York's Congressional delegation last month to announce the Green Taxis Act, which would require more efficient taxis to operate in the city. Photo by Nick DeSantis. Mayor Michael Bloomberg and two members of New York’s Congressional delegation have jump-started their stalled effort to transform the city’s yellow taxi fleet into a lean, green machine. But their proposal has some cab drivers and fleet operators seeing red. Bloomberg partnered with Senator Kirsten Gillibrand and Representative Jerrold Nadler last month to announce the Green Taxis Act of 2011. The bill would allow the city to set higher fuel efficiency standards for its 13,000 cabs. It represents the latest chapter in a four-year effort that has drawn criticism and lawsuits from the taxi industry. The conflict arose in 2007 when the industry challenged Bloomberg’s first effort to improve fuel efficiency standards. After three years of appeals, the courts ruled the Clean Air Act of 1963 gives federal emissions laws priority over local governments’ standards, making Bloomberg’s old proposal illegal. He said the new Green Taxis Act will give his administration the authority to go beyond the requirements of the Clean Air Act, which stands in his way in spite of its environmentally friendly goal. “These laws, despite their original intentions, are doing more to hinder than to aid the progress that we need,” he said. Some drivers resent Bloomberg’s campaign; they argue the hybrid technologies he favors cannot withstand the punishment of New York’s streets. A greener fleet, they allege, is too expensive to be practical. Dorzilor’s first introduction to green technology drained plenty of green from his pocket. He said the city urged him to purchase a Toyota Highlander hybrid in 2008. The SUV cost $47,000, and he spent $5,000 more to turn it into a taxi. Within a year, the repairs began to pile up; he spent another $19,000 fixing the car’s brake system, battery and damage to its body. Dorzilor decided he had taken enough financial damage. His dull yellow hybrid now sits idle across the street from a depot on Brooklyn’s 4th Avenue, with its faded taxi logo broadcasting a constant reminder of the owner’s aborted experiment. “They never figured out what kind of problems the hybrid can have,” he said, shaking his head. Dorzilor and other hybrid skeptics prefer the Ford Crown Victoria, a New York icon with a reputation for being durable, dependable, and – as the green taxi campaign warns – dirty. “The most ubiquitous taxi, the Crown Victoria, is not a clean machine,” said Nadler at a City Hall press conference announcing the Green Taxis Act. Nadler was being generous; the Crown Victoria is the worst polluter in the fleet. Of the New York City Taxi and Limousine Commission’s 11 approved current-year vehicles, the Crown Victoria gets the lowest gas mileage at 16 miles per gallon. The second worst polluter is the Toyota Sienna accessible van, at 19 miles per gallon. All of the other models achieve at least 28 miles per gallon, according to FuelEfficiency.gov. The Crown Victoria’s dirty habits might not be a problem if it wasn’t the most popular model. But TLC spokesperson Alan Fromberg said the car dominates the fleet by two to one. The high number of Crown Victoria taxis on the streets poses a difficult dilemma for city officials. The car is produced only at Ford’s St. Thomas Assembly plant in Ontario, Canada. Ford spokesperson Anne Marie Gattari confirmed that the plant will close its doors for good in August, leaving question marks parked where Crown Victorias used to be. The Bloomberg administration saw the Crown Victoria’s extinction coming in 2007 and tried to implement cleaner technologies. But the Metropolitan Taxicab Board of Trade, an associated representing 31 fleets, challenged the proposed rules and defeated the city in court. Much like today, the group argued then that the Mayor’s plan would put fleet operators in financial peril. 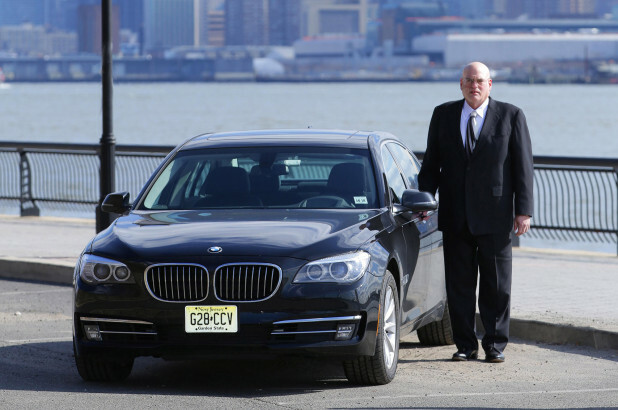 “Certain cars are just not suited to be taxicabs,” said Warren Prosky, a Brooklyn fleet operator and MTBOT member. The prolonged legal battle ended when the Supreme Court declined to hear the case in February, paving the way for the new Green Taxis Act. Gillibrand, who called the Supreme Court’s decision “deeply disappointing,” said her colleagues in Congress would have to step in and help New York’s taxis go green. “The city’s legal options have been fully exhausted, and it’s up to Congress to act,” she said. That progress could include a 296,000-ton reduction in greenhouse gas emissions if the bill passes, according to Gillibrand. And despite their colleagues objections, some drivers said they would be happy to see cleaner skies in New York. Zahid Ishaq, 41, bought a Ford Escape hybrid in 2009 as a change of pace from his old Crown Victoria. He is content with the cheaper fuel bills, but not convinced the car has saved him much money. “The advantage is you save about 35 percent on gas, but the disadvantage is that when it comes to repairs, it costs the same percentage more than the Crown Victoria,” he said with a shrug after dropping off passengers in the parking lot of Brooklyn’s Hotel Le Bleu. Ishaq said if Bloomberg’s fuel efficiency campaign succeeds, the city’s taxi drivers may have to make a hard-earned change in their habits.